After WWII, Tempo assembled Land Rover series ones, rather as did the Belgian firm Minerva. 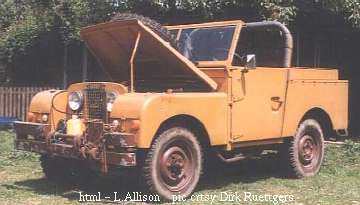 The Land-Rover bodywork was modified and locally produced to add "local content". An interesting feature is the useful-looking locker built into the front of each mudguard (wing). Initially the 1.6 litre, 80" (wheel-base) series one was assembled, later the 2.0 litre, 86". Thanks to Dirk Ruettgers and Richard Hughes.